We have 2 boats diving the wrecks and reefs from Spiegel Grove off Key Largo to the wreck of the Eagle off Islamorada each day, depending on conditions. Some of the best diving in the Key Largo area. We are located in the Upper Florida Keys in Tavernier, which is just South of Key Largo and North of Islamorada. Running out of Tavernier Creek Marina, we cover over 24 miles of reef line giving us access to all the best reef and wreck diving from Key Largo to Islamorada. We dive sites along the main reef line as well as numerous shallow patch reefs. This includes Molasses Reef, Pickles Reef, the Conch Reef System, Davis, Crocker, Victory, and many, many others. Most of these are within 20 to 50 minutes of our dock. Having access to the reef system from Key Largo to Islamorada gives our divers a wide variety of sea life when scuba diving in the Florida Keys. In addition to shallow and intermediate reefs, we also dive the major wrecks in the area, the U.S. Coast Guard Cutters Duane and Bibb, Spiegel Grove and the Eagle. Conch Republic Divers has been in business over 20 years. We are conveniently located in Tavernier Creek Marina giving us quick access to dive sites. In addition to having access to all the best reefs and wrecks in the Florida Keys, Conch Republic Divers is a full service dive shop. We offer both dive and snorkel trips, gear rental, sales and service, dive training from beginner through professional ratings, hotel accommodations and much much more. Come see why we are not just another dive shop. 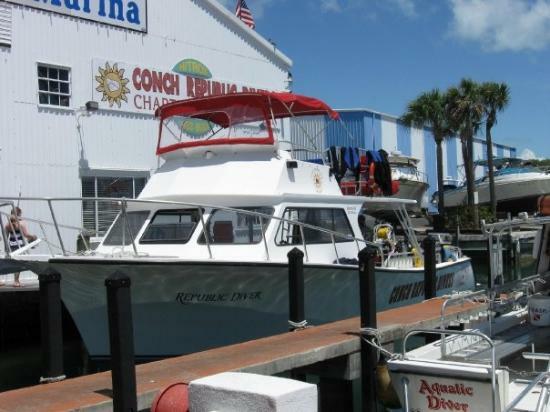 All of Our Crew here at Conch Republic Divers has extensive experience in the dive industry. We are here to make sure you have a wonderful dive experience as well as keeping you safe. We pride ourselves with our safety record and make it our #1 priority. Once your dive is over, we have on site hot showers, and gear storage so you don’t need to transport your wet gear .